Lock in a great price for Freeborn Hostel – rated 8.9 by recent guests! The owner was very friendly and helpful. 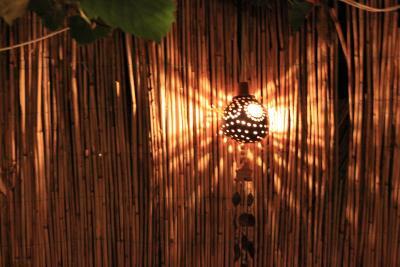 The place is small and cozy. 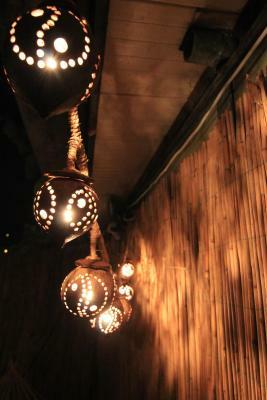 A perfect place to stay and meet new people in a homely setting. either staffs and the hostel are so wonderful and folksy. Their super warm welcome made everyone here so participable. 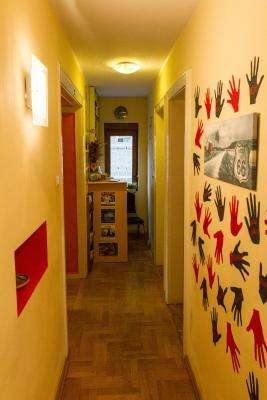 Every staff have full knowledge about Timişoara, very helpful and enjoyable. I definitely will nostalgize the moment I stayed there. 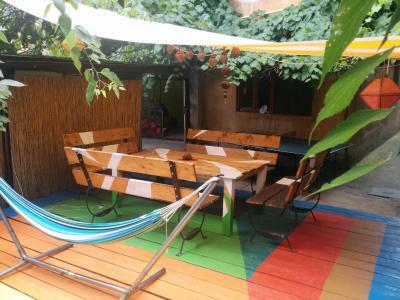 Great location- 1 minute walk from main square. Really friendly and inviting staff who gave lots of information about Timisoara. 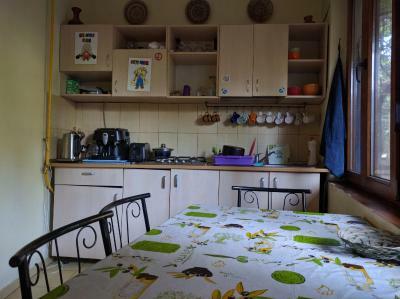 Well equipped kitchen with large supermarket 5 minutes away. Good sized twin room, shared bathrooms were all clean. Great and helpfull staff, Hector, amazing guy. Good location. Thank you. The host, a Mexican volunteer, was brilliant, very helpful and friendly, waited us till late and gave some good tips. 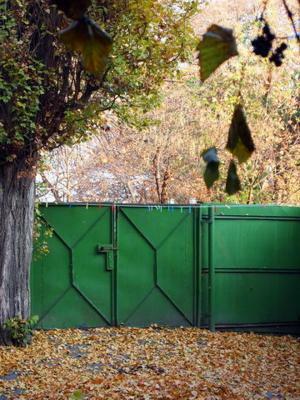 Excellent location, it's just few minutes walk from Piata Unirii in a more quiet street although the entrance was not easy to find at night. 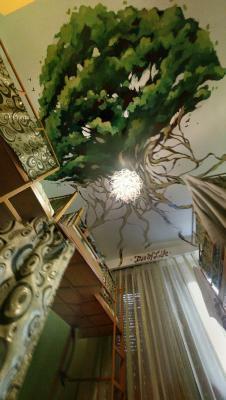 It iż an amazing hostel. I felt there both like home and super relaxed. Raul - the owner is super friendly. 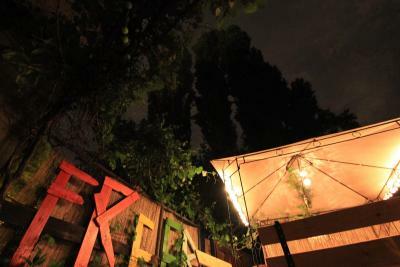 Płace gathers all the best backpackers from all around Balkans. And it’s super close to city centre. Highly recommended. Wonderful position, the owner is a very nice guy, it has been a pleasure! The owner was extremely helpful and friendly, the location is great. Host was very friendly and helpful. Being a hostel facilities were shared however this was not a problem for us. Location was very convenient to old town. 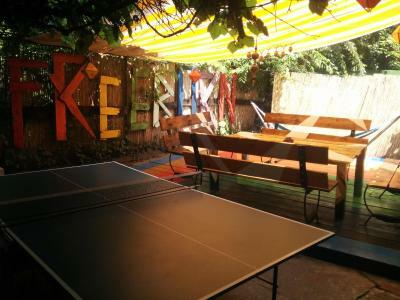 Offering free Wi-Fi and free private parking within 350 feet from the city center, Freeborn Hostel has a fully equipped common kitchen and a lounge area with Nintendo Wii and movies on demand. Free tea and coffee are available. Guests are welcomed with a complimentary shot of homemade Palinca brandy. The courtyard features a barbecue and a seating area. 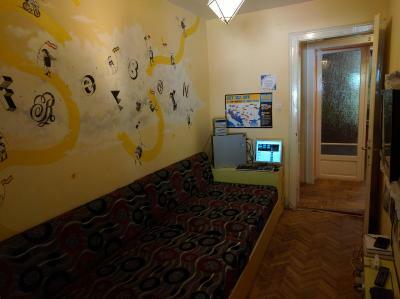 Freeborn Hostel enjoys the proximity of many cafés, restaurants, clubs and parks in the center of Timișoara. The 15th-century Huniade Castle is just steps away. The nearest tram stop is just 650 feet away and offers links to Timișoara North Train Station, which is 1.9 mi from Hostel Freeborn. 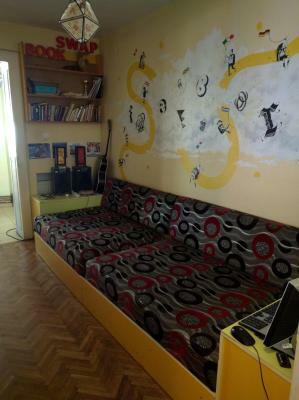 This property also has one of the top-rated locations in Timişoara! Guests are happier about it compared to other properties in the area. 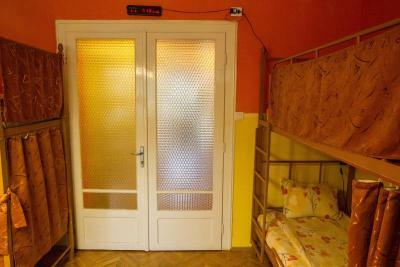 This property is also rated for the best value in Timişoara! Guests are getting more for their money when compared to other properties in this city. 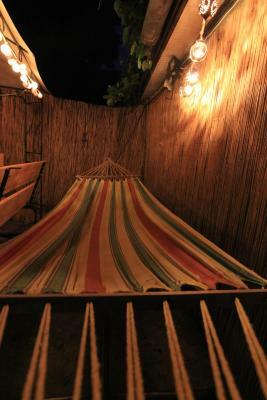 When would you like to stay at Freeborn Hostel? 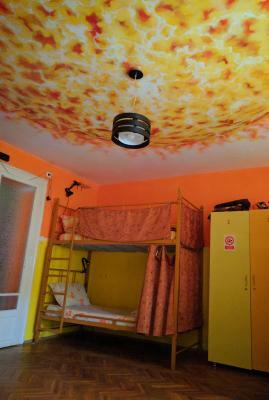 Room decorated in warm colors, offering lockers, privacy curtains and lamps for every bed . 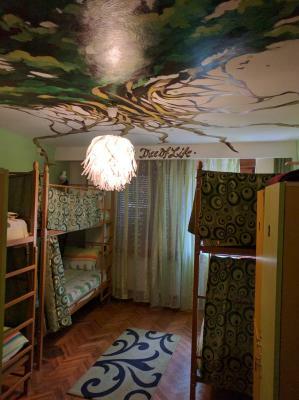 Room decorated in green and blue, offering lockers with large mirrors and lamps for every bed . 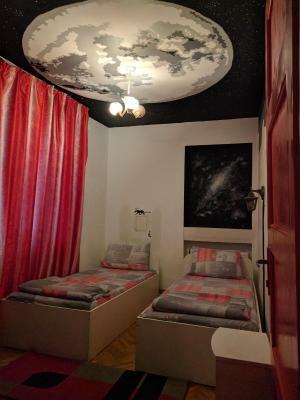 Compact room with galaxy-themed paintings and a large fluorescent moon on the ceiling. It offers access to a shared bathroom. 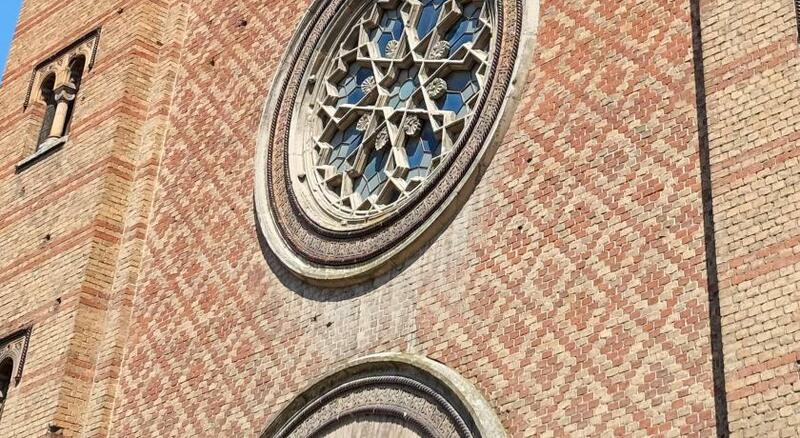 Timişoara’s old town is full of impressive Secession architecture, giving it the nickname "Little Vienna." Several parks enhance the beauty of landmarks like the Orthodox Cathedral and Union Square. 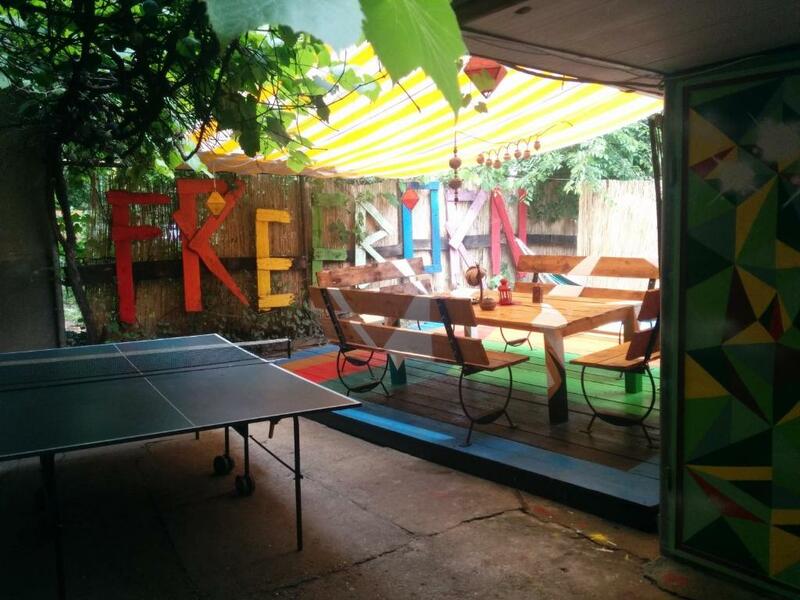 House Rules Freeborn Hostel takes special requests – add in the next step! Freeborn Hostel accepts these cards and reserves the right to temporarily hold an amount prior to arrival. 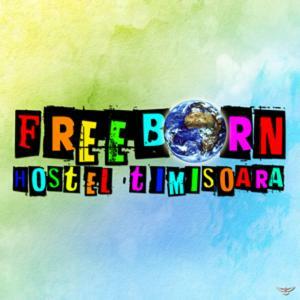 Please inform Freeborn Hostel of your expected arrival time in advance. You can use the Special Requests box when booking, or contact the property directly using the contact details in your confirmation. One of the most picturesque neighborhoods in Timişoara! There is no microwave. We were given other room than we had booked (empty dorm instead of private room with two beds), which was not a big difference. 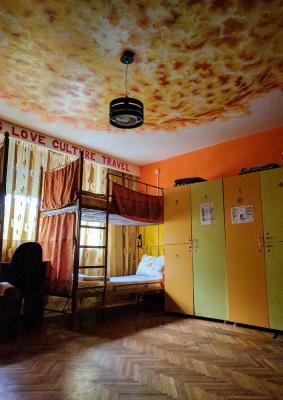 However when we asked for another night they offered us a higher price for beds in dorm (this time with other guests) than we paid for private room, which was rather odd considering the circumstances. It smells like feet very strong from the moment you open the door. The main entrance could be tricky if you have big suitcases with you. 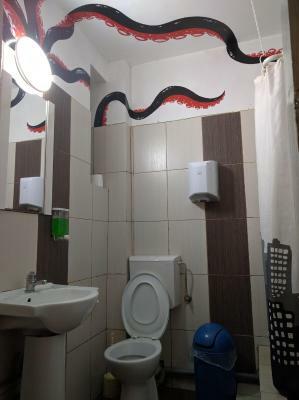 Not that it caused any issues (it was fine for a short stay) but keep in mind that the place is rather compact and there's only one bathroom inside. Great location and staff. Owners exceptional. There was no private parking. Bathroom and sleeping room were quite messy. Cockroaches on the terrace but we didn't see any inside. Could be noisy late at night.